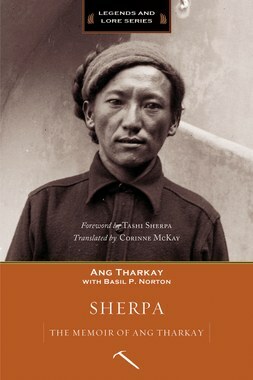 Mountaineers Books has just published "Sherpa: The Memoir of Ang Tharkay." We'll host a Seattle area launch on April 13 at Folio. Ang Tharkay, born in 1908, became one of the most renowned Sherpas of early Himalayan exploration. His autobiography has long been a collector’s item in the original French-language edition but it has never been available in English until now. Mountaineers Books is proud to make Sherpa: The Memoir of Ang Tharkay more widely available through our Legends and Lore series. It's an inspiring story, a terrific read, and it comes from a voice that has been far too silent in mountaineering literature. In Sherpa, Tharkay describes his experiences traveling with Eric Shipton and H.W. Tilman and as the sirdar (head Sherpa) on Maurice Herzog’s 1950 ascent of Annapurna. Few such Sherpa accounts have been written, and fewer still from these early Himalayan expeditions. Opening with a brief account of Tharkay’s childhood and background, Sherpa then immerses readers in expeditions on Everest, Nanga Parbat, and, of course, Annapurna. Tharkay reveals some of the politics within the Sherpa support teams: petty arguments and shared struggles that went unnoticed or at least unrecorded by those who hired them. Tharkay’s admiration of his employers is leavened with his recognition of their shortcomings, but his affection for the climbers who employed him - and theirs for him - radiates throughout the story. Our publication of Sherpa includes an original foreword by Tashi Sherpa, founder of Sherpa Adventure Gear and the nephew of Ang Tharkay. He remembers how he and his young cousins worshipped “Agu” (Uncle) as a respected mountaineer and hero, a warm and safe presence for the family. Ang Tharkay’s son, Dawa Sherpa, provides a brief afterword to the book. Little is known about Basil P. Norton, who assisted Tharkay with his original text, Memoires d’un Sherpa, published in France in 1954. Mountaineers Books was able to make this inspiring book available in English thanks to the generous support of our Legends and Lore Founders and Supporters.